Thursday, October 27th, 2016 at 5:41pm. 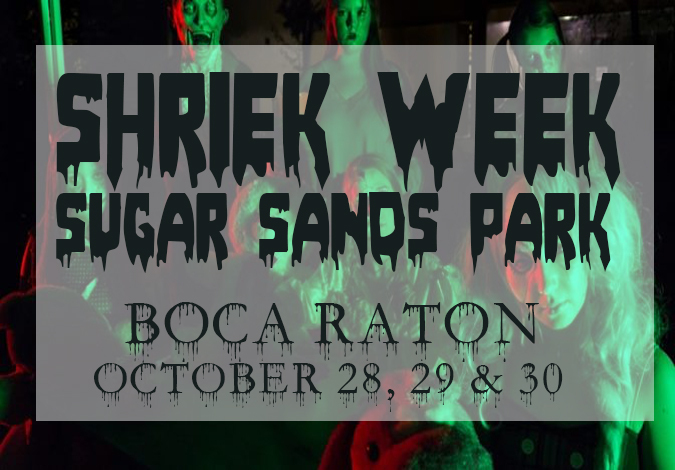 Hurry up and get your chance for fun and thrill in at the last few days of Shriek Week at Sugar Sands Park in Boca Raton. This week of crazy tricks and treats is the perfect destination to bring your kids this Halloween Weekend. Shriek Week has been a smash hit so far this week but is continuing until Saturday. The theme for this year’s Shriek Week is “Florida’s Terrifying Tourist Traps.” So the entire event will take you through some of Florida’s scariest towns and creepiest destinations. The haunted house is filled with frightening characters and fun rides. There will be crafts, stilt walkers, magic shows, live entertainment, trackless train rides, a free trick or treat trail, a black light carnival game room and tons of food and drink vendors.